Hope you’re having a great weekend. 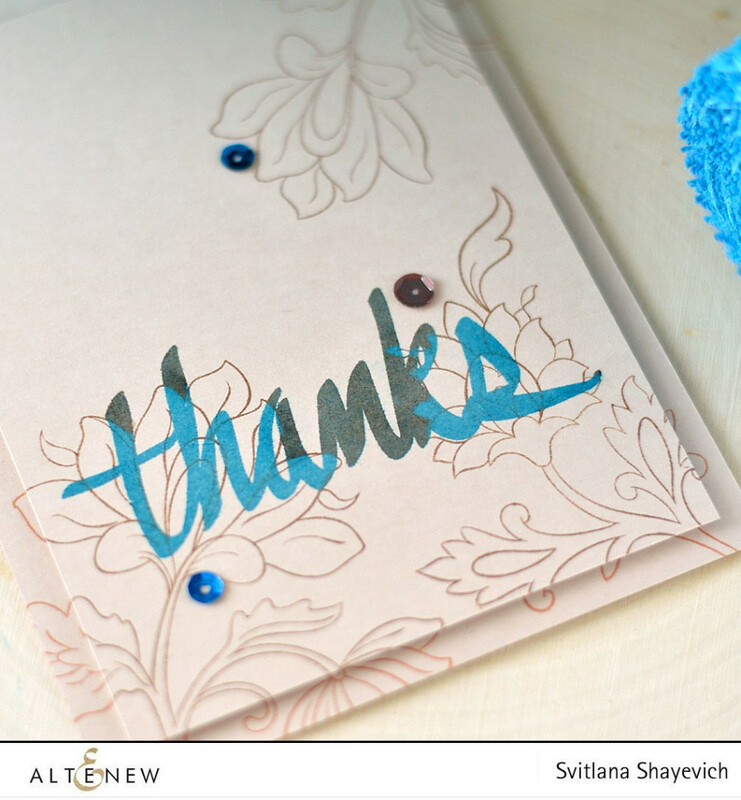 Today I’m over on Altenew blog want to sharing a card featuring two dimensional background and two color sentiment. After my focus post for Altenew January release I was asked a lot how I made a multi-color sentiment on one of the cards (well, apparently I totally failed explaining it in my post ;)). It was pretty simple to create, just masking and double stamping. But it’s probably harder to explain written down. So I decided to film a video showing how I did this. And this is my first craft video ever (eek!). I used Altenew Persian Motifs stamps set to create the background design. To create two dimensional effect I took an A2 card base and a panel of the same size. Stamped the same design onto both of them (only used different inks, Altenew Paper Bag for the card base and Altenew Dark Chocolate for the panel). Next I cut a quarter of an inch from each side of the panel. Then I moved on to stamping the sentiment, using thanks stamp from Altenew Super Script 2 set. First stamped the sentiment using Altenew Dusk ink. Next – masked flowers, that are overlapped by the sentiment and stamped over with Altenew Dark Chocolate ink. As the masking paper have some thickness – some parts of the sentiment were stamped perfectly right next to the mask. It’s better to keep this in mind cutting out a mask. It has to be a tiny bit smaller then a stamped image. But if some boo-boo happened – it’s easy to correct. I used Fantastix tool (which is a pencil shaped thingy made of foam), but a small brush would work the same. Hope you like my card and enjoyed watching the video (and hope the video is not so horrible lol). Awesome!! Fantastic card!! Love it! AWESOME card, AWESOME video, AWESOME technique. Just a terrific idea. Loved the color combination ,as well. I loved the video. It was very easy to follow. I love the music you chose, too. Thank you! Your support means so much for me!